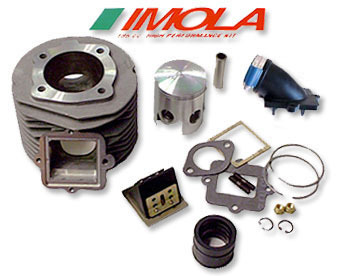 A smaller version of the TS1 kit for your 125-175cc Lambretta when used with a TV175 length 116mm rod on the crankshaft (note: piston shown is actually the Li/GP type piston). With a 28mm carb (sold separately), the ?Baby TS1? will give you an honest 13hp using a GP200 exhaust system, and 16-22hp with an expansion chamber (keep in mind that Innocenti?s claims of 10hp or more for stock 200cc machines were measured at the crankshaft and correspond to about 8hp at the rear wheel). But it is not just peak horsepower that makes this kit a winner - it?s the wide spread of power it offers throughout the rev range that makes it so fun to ride without being ?peaky?. The kit requires a GP crankshaft with a TV length rod, a GP electronic magneto, a 28mm carb, an expansion chamber or GP200 exhaust system, and an upgraded clutch. Since the carb is relocated to the right side of the engine, the battery tray (if fitted originally) will have to be removed or relocated to the left side of the frame. Complete cylinder kit includes the nikasil lined alloy cylinder, piston kit with rings, wrist pin and clips, intake manifold, reed valve assembly, and all necessary hardware.